Tusshar Sasi	 January 21, 2017	 Leave a Comment on “Munthirivallikal Thalirkkumbol (മുന്തിരിവള്ളികൾ തളിർക്കുമ്പോൾ)”… Some sizzling chemistry saves the day! If made well, there’s no genre as effective as relationship drama. Their emotional resonance lingers, thus rendering them repeat value. When Malayalam cinema’s much-loved pair Mohanlal and Meena decide to reunite with one such film, expectations hit the roof. Yes, the film has a lot of romance satiating many thirsty souls. But, Jibu Jacob’s Munthirivallikal Thalirkkumbol decides to wear many more garbs. Do all of them work? With a translation as dreamy as ‘when grapevines sprout’, the film kicks off as a laboured family saga, with a romantic side pending to erupt. One should note that it is about a dysfunctional couple, not a loveless family. Told in a classical fashion, protagonists Ulahannan (Mohanlal) and Anniyamma (Meena) find themselves stranded at a juncture where their relationship has lost all its steam. Their bond awaits a desperate breather, a necessary rekindle. Subsequently, we are introduced to Ulahannan’s campus sweetheart, Indulekha (Asha Sharath) expositioned in the narrative for a reason. Ulahannan also enjoys a tame taste of infidelity, a comfortable escape from passionless marriages. Encouraged by his philandering friend Venukuttan (Anoop Menon), this segment is carefully visualized and shot without any risque elements in sight. There is a lot to like in Munthirivallikal Thalirkkumbol as writer Sindhuraj and director Jibu Jacob put us through a smooth first half, that ignites big-time as the couple rediscovers their lost love. One important song and another peripheral one later, we feel chemistry and plenty of sizzle around. For a film that assimilates solid values on meaningful nuptial ties, it is pitiable how it falls prey to a meandering second half. The primary issue post-interval is that Munthirivallikal Thalirkkumbol almost suddenly turns into a clueless activist. Despite intermittent moments of newfound romance, the film goes on a process of ‘mending’ things. Some are straightforward and amusing (the nurse and her homemaker husband), most others fall flat. Especially the political turnarounds at Ulahannan’s workplace protrude tastelessly in the screenplay. Sindhuraj decides to pass on another simplistic lesson with the way he transforms Venukuttan’s flirtatious ways. Another key grudge is in the way Sindhuraj designs his women characters. Meena’s Anniyamma is an author-backed role. Other ladies find no such discretion. A significant nail in the story – Gini’s (Aima Sebastian) characterization is puzzling for no reason. The writers gets a good thread on a teenager ‘possibly’ getting influenced by her parents’ physical intimacy. Gini is neither a frivolous teenager nor one that knows her mind. Attempting to make her an intriguing catalyst, the writer ends up serving nothing but ambiguity. Remaining ones, be Latha (Srindaa) or the coquettish colleague of Ulahannan – these women are burdened with uni-dimensional parts with zero layers and thoughts going into building their psyche. There is also a femme fatale (Neha Saxena) complete with a sensuous midriff and flowing sarees. We don’t really mind her much but can’t out filmmakers try a different dubbing artist, at least? Once the Shimla vacation number (‘Athimarakombine’) concludes, the proceedings turn into that of a do-gooder TV series. With some lovable romance and humour thrown in, we get a severe déjà vu of early 2000s’ Chila Kudumba Chithrangal and many others. Pace slackens, making us indifferent and unreceptive to scenes that unfold. There is also a mindless family number (‘Punnamadakaayal’) which contributes nothing to the narrative than setting in boredom like a forced tourism commercial popping out of thin air. For a film that steers clear of elevated drama and tumultuous twists, the momentum it gathers in the last reel is alarming. Despite its one-note lesson on teenage parenting, trust Mohanlal to lend his Midas touch and come out trumps with a proper finale. 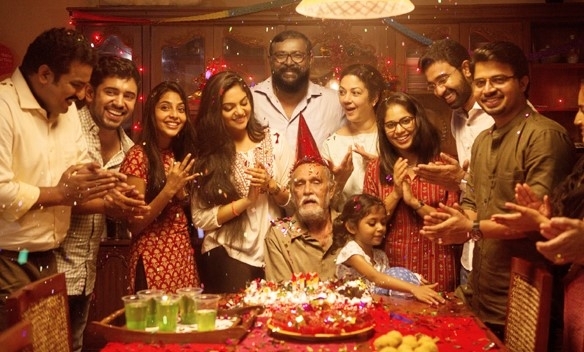 Serving a well-intentioned message, the film closes on a sober, sublime note filling you with positivity and a warm smile. 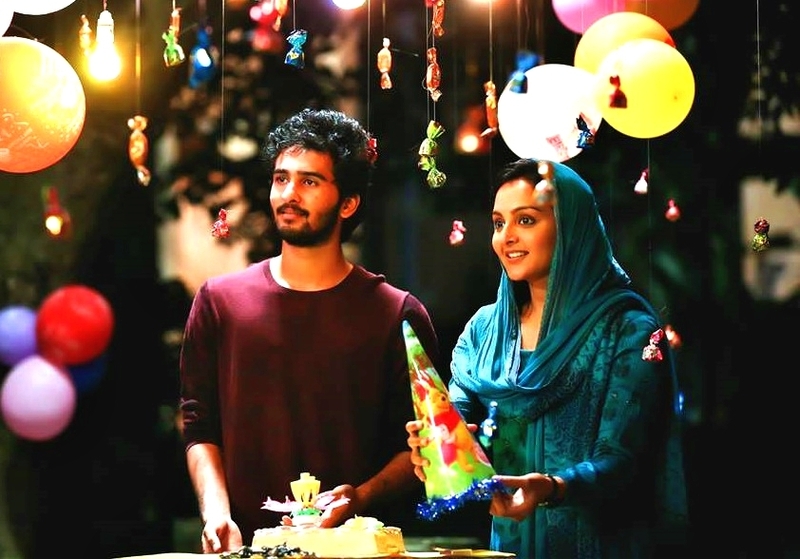 Cinematography by Pramod K Pillai is in tune with the film’s small-town syntax. Having said that, the Shimla song sequence should have been shot way better as it misses a sync between choreography and overall frame construction. Coming to the very same song (‘Athimarakombine’), it reveals Malayalam lyricists’ creative bankruptcy or plain laziness in making content that is contextual. There’s rekindled romance, stunning outdoors, a decent tune and reliable vocals. Then all we get are metaphors on ‘flowers blooming’ and ‘longing nightingales’. Give us a break! ‘Oru Puzhayarikil’ by Shweta Mohan works very well owing to its significance in the tale. Dialogues are okay often outstripping the film’s partially realistic setting. The ones exchanged between the lead pair are well-penned, more or less. Now let’s talk about the film’s mainstay. If there’s one thing that makes Munthirivallikal Thalirkkumbol a must-watch, it is Mohanlal and Meena’s smouldering chemistry. Here is one romantic pair who have never been a part of anything marginally realistic. In their all previous outings, the duo saw a veil of overbearing, volcanic plot lines covering their palpable chemistry. Nonetheless, in each of them they always managed (at least) one deeply romantic moment that somehow established their cherubic chemistry. Take this scene from Chandrolsavam. With a peculiar camera placement, dramatic intonation and heavy music – this scene might not work for many but it works beautifully for me. Love in Munthirivallikal Thalirkkumbol originates from the same school of thought as Ulahannan and Anniyamma, at one point, begin to communicate in a lingo that is laden with mystic prose. They are shown to be educated. Ulahannan helps his daughter grasp exquisite 30s literature. His status quo with Indulekha hints us of a romantic man, alive somewhere deep within. Though we aren’t told about Anniyamma’s past, she is one who finds solace in evening television soaps. So much so that her defensiveness follows a similar discourse. In difficult times, she is shown to balance Ulahannan’s indifference with an explicit sternness. Later when the couple attempt to reconfigure their relationship, the film undergoes a tonal metamorphosis and ends up with some genuine dramatic moments. Mohanlal delivers yet another winsome performance, proving with ease that his prowess in expressing romantic love will always stand unparalleled. We just wish there was less of an attempt to “mainstream” Ulahannan in the latter half. Because the faulted, ill-groomed Mohanlal makes a fascinating picture. Meena is excellent as the mature, loving Anniyamma. She looks gorgeous and her gestures are a treat to watch. Anoop Menon, surprisingly, puts in a fabulous effort. Supporting actors do their best except a couple of female players who are saddled with half-baked parts. As the first half concluded, I remember telling myself, “Ah, there’s nothing like a gooey romantic film as this!” – only to partially retract the statement later. Yes, one wishes Munthirivallikal Thalirkkumbol had taken the Thanmatra route of unrehearsed everyday-ness. Now that we don’t have any such luck, let’s better be happy with some glistening camaraderie. Unlike the couple’s last outing Drishyam, Ulahannan and Anniyamma are equal partners, their family is an ‘aware’ unit. She is no damsel in distress. He is no saviour. In their remarkably well-written characters, one ought to thank Mohanlal and Meena, for making us fall in love with them… all over again! Need proof? This shimmering romantic number has it all over. Amen! Previous Post“OK Jaanu”…. Nothing is okay in this stagey, monotonous remake!